We are so very proud of our colleagues Ayanna Anderson, MPS, MS and Beau Kelly MD MBA FACS of Donor Network West, for launching a groundbreaking June campaign, "Giving me Life: A Visual Journey of Organ and Tissue Transplant Recipients." June 9, there will be an opening exhibit reception celebrating the breathtaking photography of social documentary genius, Katie Sugarman, and her depiction of the remarkable transformation of (9) African American recipients are truly giving me life! What's even more exciting is that we're offering an afternoon of beautiful art, music, food AND compelling conversation! 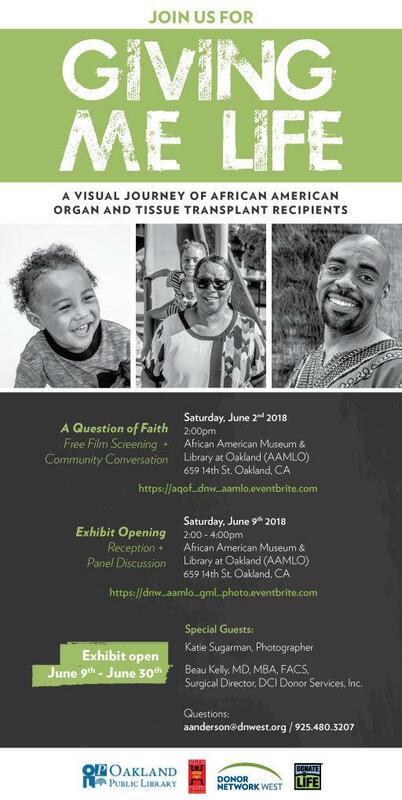 Also on June 9, a panel, "In Focus: Cultural and Clinical Considerations for African Americans and their Donate Life experience" will showcase the authentic and inspiring reflections of African American clinical and healthcare administration leaders, recipients, and donor families. We encourage everyone to join.